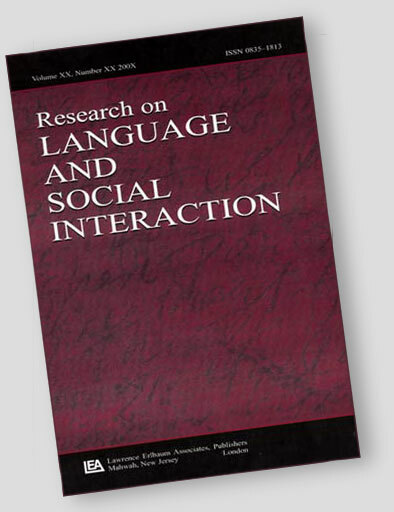 Several publishers have series devoted to interactional studies, and among them is the ever-lively collection Directions in Ethnomethodology & Conversation Analysis. Andrew Carlin has kindly agreed to give us an account of the scope and range of the series, and what the collection is trying to do. With the closure in 1994 of George Psathas’ Studies in Ethnomethodology and Conversation Analysis, there was a need for a new book series that was recognized as an outlet dedicated to high quality ethnomethodological and conversation-analytic research. When the late Steve Hester and Dave Francis took over as directors of the IIEMCA, they set up Directions in Ethnomethodology & Conversation Analysis to fill this gap. Since then, the Series has undergone significant changes. Sadly, the main change, of course, has been Steve Hester’s untimely passing, in April 2014. And last year Ashgate was taken over by Taylor & Francis Publishing Group. So, starting with Sara Keel’s recent study, all titles in the Series are now published under the Routledge imprint. I was invited to become a co-editor with Dave Francis, in 2014; the IIEMCA conference at Kolding, University of Southern Denmark, was my first opportunity to attend an EMCA event in this capacity. Dave has now decided to retire and we are delighted to announce a new co-editor, K. Neil Jenkings. To mark the changes, we have assembled an extremely high-profile International Advisory Board, and I’m delighted to report that Dave Francis has kindly agreed to become a member of the Board, so that Neil and I, the new editors, may continue to benefit from his expertise. “Ethnomethodology and Conversation Analysis are cognate approaches to the study of social action that together comprise a major perspective within the contemporary human sciences. Ethnomethodology focuses upon the production of situated and ordered social action of all kinds, whilst Conversation Analysis has a more specific focus on the production and organisation of talk-in-interaction. Among the strengths of the Series to date has been a distribution of outputs in Ethnomethodology, Conversation Analysis and Membership Categorization Analysis; and we wish to maintain these going forward. to highlight just a few of the remarkable texts that are available in the Series. The studies in the Directions in Ethnomethodology & Conversation Analysis Series share deep engagement with data, with members’ practices in naturally occurring settings, with the essential reflexivity of accountable actions. We shall continue to support edited and monograph formats, and we are very excited about some new book projects that are in progress. With a new editorial team, we would like to invite you to submit proposals for monographs, and edited collections, to the Series. If you are interested in submitting to the Series, or are unsure whether your work would be suitable for the Series, feel free to contact K. Neil Jenkings and/or Andrew P. Carlin. Or, you can contact the relevant Commissioning Editor at Routledge here. George Psathas 1990 Interaction Competence Lanham, MD: International Institute for Ethnomethodology & Conversation Analysis/ University Press of America (ISBN 0819176354) SECA No. 1. Edward C. Cuff 1994 Problems of Versions in Everyday Situations Lanham, MD: International Institute for Ethnomethodology & Conversation Analysis/ University Press of America (ISBN 0819191493) SECA No. 2. Paul ten Have & George Psathas 1995 Situated Order: Studies in the Social Organization of Talk and Embodied Activities Lanham, MD: International Institute for Ethnomethodology & Conversation Analysis/ University Press of America (ISBN 0819196258) SECA No. 3. Stephen Hester & Peter Eglin 1997 Culture in Action: Studies in Membership Categorization Analysis Lanham, MD: International Institute for Ethnomethodology & Conversation Analysis/ University Press of America (ISBN 0761805834) SECA No. 4. Paul L. Jalbert 1998 Media Studies: Ethnomethodological Approaches Lanham, MD: International Institute for Ethnomethodology & Conversation Analysis/ University Press of America (ISBN 0761812865) SECA 5. Finally, we wish to bring your attention to a forthcoming book that has been “in production” for many years. Steve Hester had been writing a book on deviance and membership categorization analysis for a long time, in part an evidence-based response to Emanuel Schegloff’s Tutorial in Membership Categorization. Steve wrote numerous versions of key chapters, organizing them in different ways, but unfortunately he died before it was submitted to the Series. It will be hosted by the emca:legacy site, which is edited by Johannes Wagner, at the University of Southern Denmark. We are all extremely grateful to Dave and Peter for their generous, hard work in ensuring that Steve’s work is completed and made available as he had wished; and to Johannes, for preserving a link to it. We shall let ROLSI readers know when it is ready for download.